Zephyr Teachout 'Abolish ICE' is not just a slogan. It's a plan to return to America's constitutional principles. The essential structure of the agency encourages lawlessness, cruelty and arbitrary abuses of power. It cannot simply be reformed. The call to abolish Immigration and Customs Enforcement started 15 years ago, when it was first created post-9/11 to consolidate power in the then-new Department of Homeland Security. 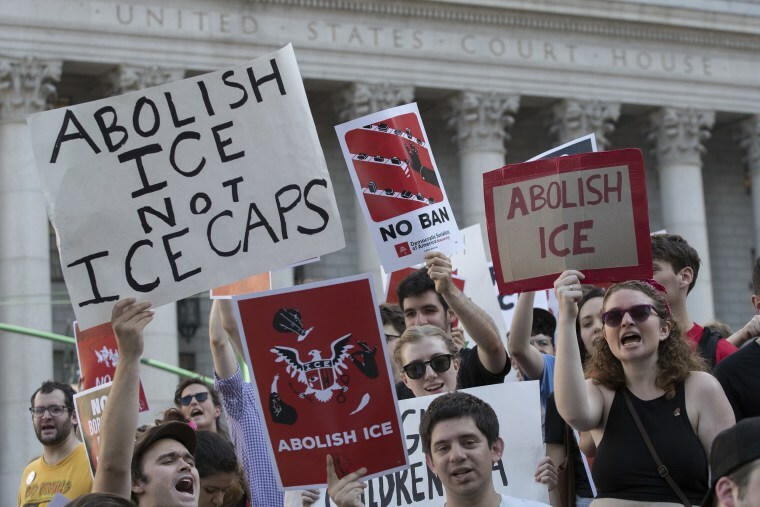 It really took hold in the last year, as activists and candidates for office (including Alexandria Ocasio-Cortez, the new Democratic nominee in New York's 14th Congressional District) started making abolishing ICE central to their platforms. It then took fire in the last month, as people have responded with outrage at the administration’s policies of separating children from their parents who are seeking asylum. The call to abolish ICE has gotten so loud that it's now even coming from inside the agency. Trying to make sense of something as outrageous as family separation has led people to realize that the essential structure of the agency encourages lawlessness, cruelty and arbitrary abuses of power by its agents. The organization was born in xenophobia and fear, and it is doing exactly what it was designed to do: terrorize immigrant communities, bring a police state inside our borders and treat people as less than human. The public’s lack of awareness, and the difficulty of accessing information about facilities, even by Congress members, is also a feature, not a bug. By moving all immigration enforcement — both ICE, which deals with undocumented immigrants and trafficking issues inside the U.S., and Customs and Border Protection (CBP), which is supposed to monitor people and goods at points of entry — into the Department of Homeland Security in 2003, the George W. Bush administration effectively insulated the agencies from broader review because, according to the Supreme Court, presidential discretion is at its peak in matters classified as national security. The organization was born in xenophobia and fear, and it is doing exactly what it was designed to do. The structural shift also encouraged Americans to think of all immigrants as outside law, as criminals and a threat to homeland security. ICE and CBP have a documented history of illegal behavior and abuse beyond family separations, including sexual assault. Reporting shows that they encourage agents to instill fear. It is not a couple of "bad apples" or bad policies: The agents reflect a culture of demonizing and dehumanizing all immigrants — and all of us are complicit in its existence. I strongly support the movement to abolish ICE, because the agency itself is a tool of cruelty and lawlessness and dehumanization. If not, ICE will continue to normalize caging people and children and midnight raids in people’s homes and businesses. To begin that process, first and foremost, immigrants — whether documented or not — should not be treated as national security threats and criminals. How we classify people has a huge impact on how we see them, and our government should approach each undocumented immigrant with an eye on her personal well-being and safety, rather than treating each immigrant as a threat. We additionally have to be absolutely clear that indefinite detention is never acceptable. Even conservative Supreme Court Justice Antonin Scalia said that “the very core of liberty” is “freedom from indefinite imprisonment at the will of the executive.” But current United States policy allows detention without a bond hearing, a slap in the face of the countries’ alleged commitment to liberty. Equally horrifying, we are holding asylum-seekers in detention facilities that violate basic human rights. Children are sleeping on cold concrete floors with glaring, endless light, open toilets, no baths and insufficient water. Clearly, children and parents should not be separated when they attempt to cross the border and/or seek asylum, and we must do everything possible to ensure every family already ripped apart is speedily reunited. The short- and long-term costs of separating families is enormous, and the administration defense that separation is a “deterrence” is illegal and inhumane. But the response to family separation cannot be, as the current administration proposes, inhumane detention. It is the constitutional right of every human in our country, documented or not, to be provided due process of law. While citizens tried in criminal court have the right to state-sponsored representation, undocumented immigrants do not share that same right, leaving them to take on the onerous task of gathering witnesses, and navigating the legal system on their own. In practice, that means that a 6-year-old child must represent herself in immigration proceedings, and that someone fleeing political persecution must have money to effectively prove his case for asylum. And the new attempt announced by Attorney General Jeff Sessions to reject asylum claims from those fleeing domestic abuse and gang violence must be rejected. Immigrants fleeing dangerous situations and brutality that their governments cannot or will not resolve deserve better than to have our government further violate their human rights, or be returned to their country of origin, putting their lives at risk. To accomplish all of this, Congress simply needs to act: The current abuses are happening not only because of the president’s bigotry and cruelty, but because of grotesque dereliction of responsibility on the part of Congress. It's within their power to abolish ICE — be it now, or after the 2018 elections. Zephyr Teachout is a law professor, constitutional law expert and Democratic politician. She is currently running for the Democratic nomination for attorney general in New York. Zephyr Teachout is a Fordham Law professor and the author of "Corruption in America: From Benjamin Franklin’s Snuff Box to Citizens United." She is currently writing a book on corporate monopolies.